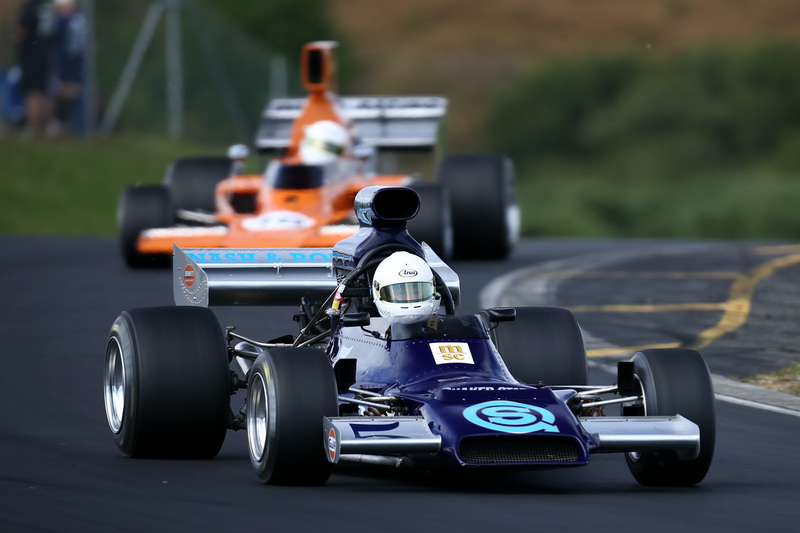 Lowering his own class lap record is evergreen Kiwi racing driver Ken Smith’s goal at the final round of the 2014/15 MSC NZ F5000 Tasman Cup Revival motor racing series at Feilding’s Manfeild circuit this weekend. While the 73-year-old currently contesting his 57th season of national level motor racing still harbours desires to compete in the 60th New Zealand Grand Prix race itself (in a contemporary Toyota Racing Series single-seater) he was told earlier in the week that the series’ organiser does not have a spare car for him to use. Ever the optimist he was not taking that as a ‘no’ on Wednesday, despite admitting that getting to contest both the MSC series final AND the NZ Grand Prix was a long shot. Either way he remains highly motivated, having finally broken life-long friend and first-time-around rival Graeme Lawrence’s F5000 lap record – lowering it from 1.01.900 to 1.01.770 – last time he was at the circuit and adamant that he can go even quicker, given the right weather and track conditions, this weekend. Or it with Smith, who – as if to limber up for a possible 60th annual NZ Grand Prix appearance, dominated the MSC F5000 series races at the recent Gulf Howden Ganley F5000 Festival meetings at Hampton Downs, qualifying quickest each weekend and going on to complete a perfect six-wins-from-six-starts clean-sweep at the second meeting. This weekend’s 2014/15 MSC F5000 series final at Manfeild is special for another reason too; it is the first time in the 11 year history of the series that a round has been held at a contemporary New Zealand motorsport meeting. Previously, rounds have always been held at classic or historic meetings. 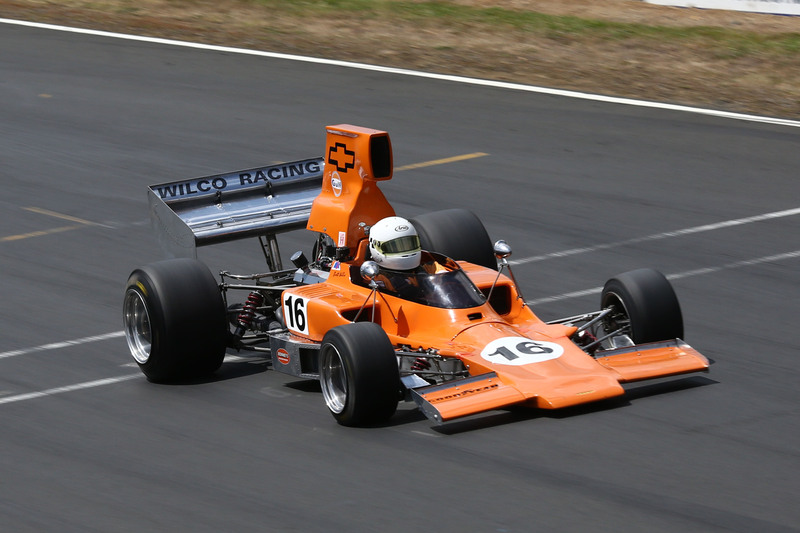 The round has attracted a 15-strong field of F5000 cars spearheaded by Smith in his ex-Danny Ongais Lola F5000 and fellow former series champion (and 2014/15 champion-elect) Steve Ross from Dunedin (McRae GM1). In the past Ross has been one of the only New Zealand drivers able to foot it with Smith at his best and heads to Manfeild on his own high having qualified on pole and won all three MSC series races (in Smith’s absence) at the penultimate round at Christchurch’s annual Skope Classic last weekend. Joining Smith and Ross on the grid this weekend is a mix of long-time series regulars like Blenheim driver Russell Greer (behind the wheel of the ex Graeme Lawrence Lola T332), UK-based series regular Greg Thornton (Surtees TS11), Skope Classic stand-outs Sefton Gibb (Lola T332) from Napier and Brett Willis (Lola T330) from Rotorua, and former series runner-up Aaron Burson and fellow Talon MR1 driving Aucklander David Banks. Adding further depth to the field are 2013/14 MSC series title-holder Andrew Higgins (Lola T400) and fellow Aucklanders Poul Christie (McLaren M10B), Shayne Windelburn and Glenn Richards (both Lola T400), series returnee Stuart Lush (McRae GM1), Calven Bonney (Begg 018) and Tony Roberts (McLaren M10A). 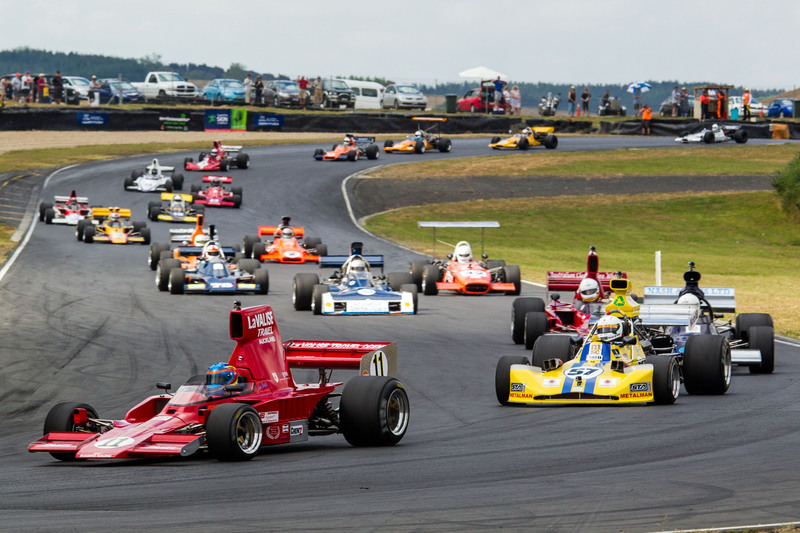 There will be three MSC NZ F5000 Tasman Cup Revival Series races on the schedule this weekend, with qualifying on Saturday morning, the first of two 8 lap races on Saturday afternoon, the second on Sunday morning and the 12-lap series final early in the afternoon. The MSC F5000 Tasman Cup Revival Series is organised and run with the support of spon sors MSC, NZ Express Transport, Bonney’s Specialized Bulk Transport, Mobil Lubricants, Pacifica, Avon Tyres, Webdesign and Exide. Ken Smith (Lola T332 #11) leads the field at the first Gulf Oil Howden Ganley F5000 Festival meetings at Hampton Downs last month. This weekend competition in the MSC F5000 series races at the 60th annual NZ Grand Prix meeting will come from Steve Ross (McRae GM1 #5) and Brett Willis (Lola T330 #16). Also competing in the MSC F5000 series races will be Tony Roberts in his recently completed high-wing McLaren M10A #7). Photo credit: Fast Company/Alex Mitchell.